This year, we decided to head for the beach for our summer vacation. Vangie and I started scouting for the beach we were going to, with the following criteria in mind: white sands with clean and clear water; relatively near yet not crowded; somewhere that can easily be reached by public transportation; and one where we don’t have to cross a body of water to reach it. We started our rese arch about one month before the trip. 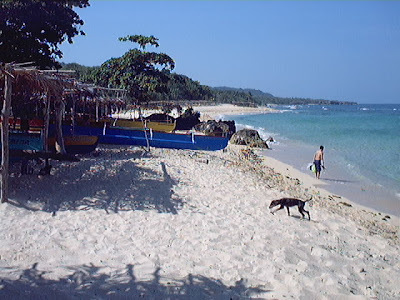 Surfing through the net, I focused my search in Region I. Bolinao in Pangasinan kept appearing and started appealing to us. I found a few sites recommending the White Beach there, particularly in Barangay Patar. 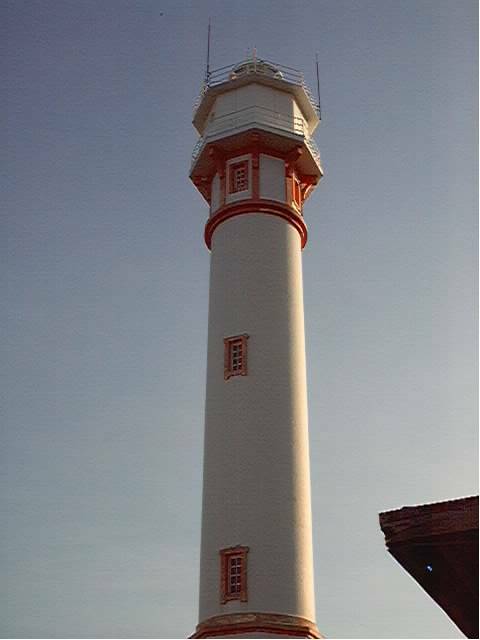 I also found out that Bolinao has the second tallest lighthouse (in case you are curious, Cape Bojeador in Ilocos Norte is claimed to be the tallest) in the Philippines. It has also a lot of caves. St. James Church has a stunning structure of dark coral rocks. 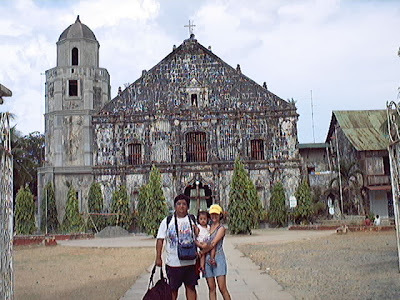 It also has the only museum in Pangasinan under the auspices of the National Museum: Bolinao Museum. With this information, we decided to go to Bolinao. Last 8 May 2003, Vangie, Angel and I met with Jerome (Vangie’s cousin) at the Five Star Bus Terminal in Pasay City where we took the midnight schedule bound for Bolinao (fare costs P297 each). 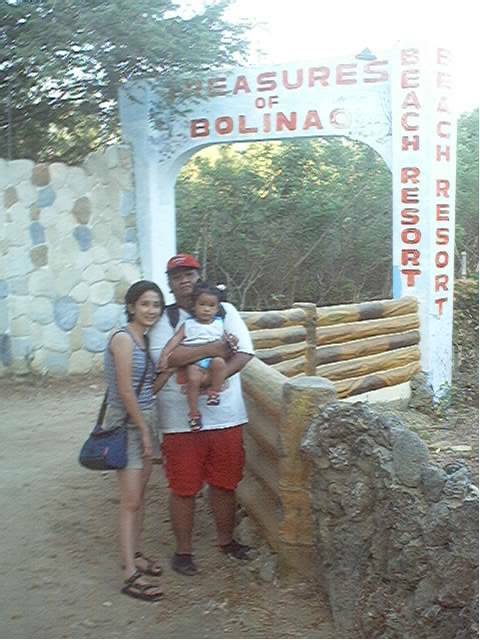 By 6 AM the following morning, we arrived in Bolinao where we immediately took a tricycle for about an hour ride to Brgy. Patar. The trip cost us P100. 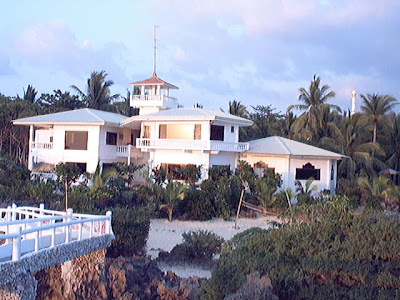 We chose the Treasures of Bolinao Beach Resort ((+632) 375-8884)) because among the resorts posted on the web, this is the nearest to the lighthouse, one of the places we planned to visit (walking distance) during our stay. 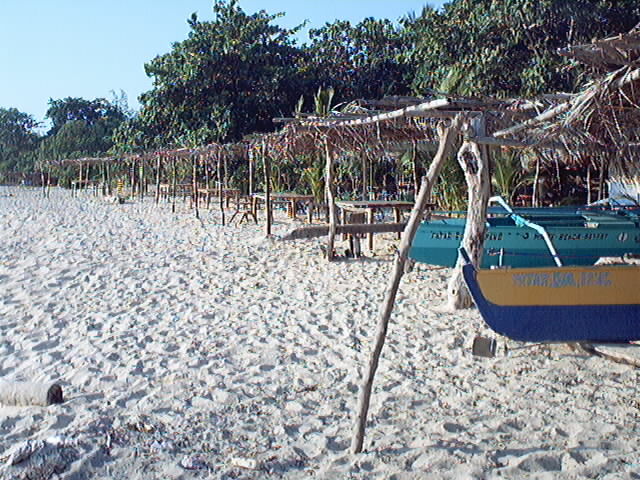 The resort’s beachfront is rocky but the white sand on another part of the beach is easily accessible. Ray Reyes, the resort’s owner, explained to us that they are in the process of constructing an access bridge to the white sand part area of the beach. After checking in, we immediately headed for the beach for a dip in the sea. The beach was clean and the water was cool and clear. We laid our blanket and things on the beach and ran to the sea. The beach was almost isolated except for about two other groups of picnickers who were so far from us that we could barely see them from where we were staying. I guess, being a Friday the beach is really not that crowded yet. We returned to the resort to have lunch but found out there was no power. We learned later, that every Friday, the electric company does maintenance work and power usually goes back at around 4 PM. After lunch we decided to head for the beach again where we had our siesta. The sea breeze and sound of the waves eventually brought us to sleep. The following day, Saturday, we got up at around 6 AM and hiked to the lighthouse. It took us around 30 minutes to get to the place. The lighthouse was locked. There was no one around. Apparently, no one takes care of it since it is automatically operated. It even has back-up batteries, which are charged by solar powered cells. We took a few pictures. The view from the place was breathtaking. You can see the beach and the resort where we were staying from the grounds of the lighthouse. We just wished that we could have climbed up to the top. I bet the view there would have been more spectacular. Alas, we had to content ourselves on reaching the place. After a few minutes rest, we decided to get back to the beach and have our last dip before leaving the place. The day before, we already asked the tricycle driver to pick us up at around 12 noon. There is a need to do this since tricycles rarely ply the route to Patar. We chose noon as the scheduled pick-up in order that we could still enjoy some time on the beach before leaving and a few hours to check out the town afterwards. The driver suggested that we visit a cave before leaving the Patar. He said that he would not charge us additional fare if we go there for picture takings. There were two caves along the way going to town: Cindy’s Cave and Enchanted Cave. We already passed the former when the driver suggested the side trip so we opted for the latter. We were charged P10 per person just to see the cave and P30 should we decide to have a dip. A couple of steps up a stair and then down the cave and there it was: a pool inside a cave. The caretaker said that the deepest part is around 8 feet and the pool is around 8 meters long. However, our supposed short side trip took us about two hours because when we got out of the cave, the tricycle had a flat tire and the driver had to take his wheel some kilometers away to have it vulcanized. He had to borrow a bicycle to have the wheel fixed. We got to town at around 3:00 PM and immediately had our lunch. 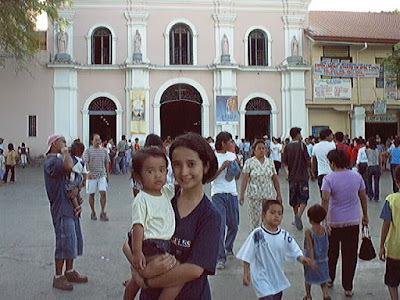 We visited the St. James Church, which is nearby the carinderia where we ate. The Municipal Hall and the bus terminal is also within the vicinity. We saw some stalls near the church selling binongey—a native delicacy made of glutinous rice and mixed with coconut milk, cooked in bamboo then roasted. We failed to buy some for pasalubong because we were planning to visit the Our Lady of Manaoag the following day and we feared that the binongey might spoil before we got back to Manila. We boarded a Bolinao Transit bus bound for Dagupan City. The bus terminal is right across the church. We chose Bolinao Transit because the locals we asked around told us that the buses from the other company still wait for passengers in Alaminos, therefore if we took that bus it would take us longer to get to Dagupan. The bus (non-aircon) left around 4:00. Vangie and I paid our fare to Dagupan (P65/person), while Jerome, who chose to return to Manila that day, got off at Alaminos where he will take the bus bound for Manila. We reached Dagupan at around 6 PM. We got out in front of the Victory Liner bus terminal and took a tricycle (P5/person) and asked the driver to take us to Hotel Victoria at A.B. Fernandez Avenue. We will be staying there for the night (P550/night) because we planned to hear mass at the Manaoag Church the following morning. Chowking and Jolibee are just walking distance from the hotel and so are the jeepneys going to Manoag (they wait for passengers in front of Jolibee. We had our dinner at Jolibee after checking in and went to bed early since we planned to go to Manaoag very early the following morning. 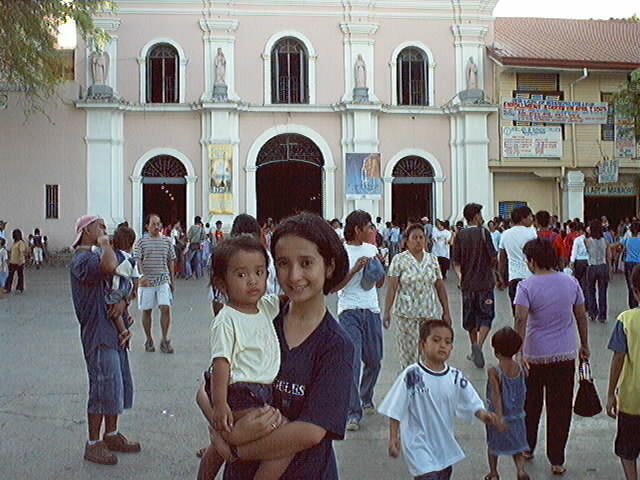 We got to Manaoag before 6 with the first mass still going on. We decided to see the image of Our Lady of Manaog first so we joined the very lone line going up to the image. After seeing the Lady, we went down again to hear the 6AM mass, after which we bought some tupig (a type of suman made of glutinous rice, mixed with coconut milk and sugar wrapped in banana leaves and roasted over a fire) in front of the church. We also had our breakfast afterwards and then proceeded to the jeepney terminal bound for Dagupan City. We passed by the town of Mangaldan, where the famous Romana Peanut Brittle, which is sold in Baguio City, is actually made. We decided not to drop by because we wanted to get back to the hotel so we can check out and get on the bus(fare P230 each) bound for Pasay. We left Dagupan at around 9 AM and finally got to Pasay at around 2:30PM. Totally exhausted, we took a taxi going home.